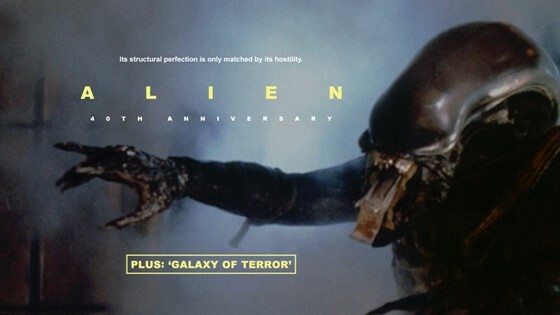 Retro Picture Show presents ALIEN (Original Theatrical Cut) and GALAXY OF TERROR - both shown from vintage 35mm film prints. In deep outer space, the crew of a commercial spaceship make an unscheduled landing on a barren and desolate planet for engine repairs. They encounter a pulsating organism which attaches itself to one of the crew members and reproduces within his body to become the deadly ALIEN. As each of the crew members is slain by the creature - one by one - the final confrontation between the last surviving crew member and the Alien culminates in an explosive conclusion. The mind's innermost fears become reality for Erin Moran, Edward Albert and Ray Walston when their spaceship rescue mission lands on a dark barren planet. After discovering a giant pyramid whose powers prevent the space mission from leaving the planet, the group ventures inside it and tries to unlock its mysteries. Each person must then face their own individual fates, strangely dictated by their secret fears. Reality battles with imagination, and both conflicting perceptions blend together and build to a terrifying conclusion.